This update is 100% old-school with games from 1985 and earlier. This is the second such update after the one in February with Pooka, Ms. Pac-Man and others. Oddly enough, that was before I even knew that Wreck-It Ralph even existed. Thanks to delays due to commissions and other projects, this update was pushed back to the month that the movie hit theaters. In other words, this is a really good time to celebrate the title and characters that built the foundation of video games. Besides, this site really needs more content from this era. 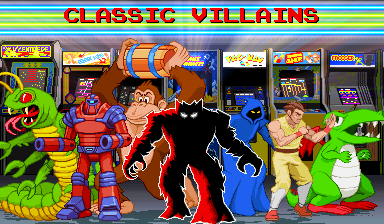 New characters: Berzerk (Evil Otto and Robot), Centipede, Donkey Kong, Donkey Kong Junior, Dig Dug, Flashgal, Frogger (and Lady Frog), Fygar, H.E.R.O., Kangaroo, Luigi, Mr. Do, Pitfall Harry, Q-Bert, the Wizard of Wor. New backgrounds: A few new backgrounds were added to Create-a-scene, box tribute and Avatar 100×100 options, but the most important is the scratch-made arcade scene. Updated screenstyles: Silver Atari 2600 box added to Box Tributes in the GroupShot. Ninja Warriors (arcade) 16×16 font added to the “Create-a-Scene 384×224 + text” in the GroupShot generator mainly because it looks like a big version of the typical font for old games. Mini-logos: Berzerk, Burgertime, Centipede, Donkey Kong, Donkey Kong Junior, Frogger, H.E.R.O., Kangaroo, Lady Bug, Mr. Do!, Pengo (in-game), Pitfall, Puckman, Stern, Sunsoft, Q*Bert, Universal, Wizard of Wor. This really brought back some good, old memories, like the days when I’d go to Lawson’s to buy comics and candy after playing the Star Castle or Mario Bros. coin-op machine. 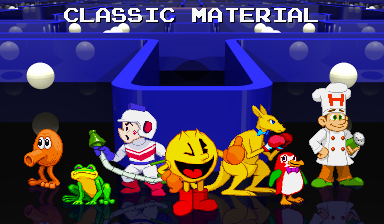 There will be at least one more update like this (though not as big) like this in 2013 to help fix the balance of 70’s-early 80’s material on this site, but I plan to mix in more classic material like this into future updates. December will have one more themed update to pay tribute to some 1987 games celebrating their 25th anniversaries. There will probably be a small update or two with random stuff in them, too. Be sure to stop by the Illmosis site to see new art projects and pixel art gallery pages with those “work progress” animations that show some of the things I did to make the sprites. Enjoy the update and the rest of your extended play weekend! 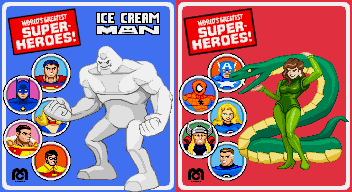 I made a semi-quick sprite of Princess Python over the weekend and then made a sprite of the Ice Cream Man (one of my characters) to post on Illmosis. Both have been added to the GFX Generators. 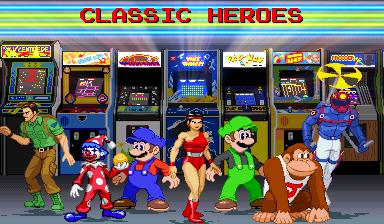 The Princess was added to the Marvel gallery and ICM was added to the Illmosis section on my sprite page. Remember that second “old-school update” I promised? It’s going down later this month. Both expected and unexpected scratch-made sprites (and more) based on pre-1986 games will hit the site. This month seems a bit more fitting since Wreck-It Ralph just made its debut and many of the characters I planned to have in the update turned out to be in the movie. That era has been mostly neglected here, but this coming update will change that quite a bit.